Tee-Ball is a team sport that is very similar to the game of baseball and is a game that is used to introduce young children to the game through its simplified rules. As well as this, it is also used as a way of helping children to develop hand/eye coordination and ball skills. The main difference between Tee-Ball and baseball is that, whereas in baseball a pitcher pitches the ball towards the hitter, this does not happen in Tee-Ball. Instead, the hitter hits the ball off a tee which is stationary, thus allowing young children an easier way of hitting the ball and engaging with the game and developing skills. Although in Tee-Ball the ball is softer, the lack of the ball being pitched also makes it safer for children. The object of the game is for one team to defeat another by scoring more runs. They do this by attempting to score as many runs as they can during their innings and attempting to prevent their opposition's scoring runs whilst fielding. However, there is a greater objective to Tee-Ball and that is to introduce children to baseball and to sport in general, so as well as helping introduce them to the rules of baseball, it gets them active, helps develop hand/eye coordination as well as ball skills. One of the reasons behind Tee-Ball’s popularity is its simplicity and the fact that it needs relatively little equipment to play. Teams are made up of between 5 and 7 players, although more can be played by agreement and all players should wear suitable training shoes. When batting, each player is required to wear a suitable safety helmet and wear gloves. The bats used should be between 25 and 26 inches long and the balls are special Tee-Ball ones, very similar to regulation baseballs but made to be softer to help minimize the risk of injuries. Scoring is like in baseball, with each member of the batting team who makes it round all bases scoring a point for their team. In games featuring particular younger children, often these games are not scored and are played solely for fun and to help develop hand/eye coordination, ball skills and have experience of playing in a team. At the end of the match, the runs that have been scored by each team are added together and the team with the most is declared the winner. If the scores are the same at the end then a tiebreaker could be played with another innings for each team although due to the friendly nature of the sport it may be decided to draw the game. In games for younger members that aren’t scored, there is no winner of the game. Tee-Ball is played by two teams of between five and seven players, but can be played with more if the team sizes are equal. A coin is tossed at the start of the game with the representative from the winning side choosing whether to bat or field first. The number of innings shall be exactly the same as the number of players on each team, with the hitting order rotating each innings enabling each player to have the chance to lead off an innings. When batting, the ball shall not be pitched but shall be placed on a tee from which the batter shall hit it. 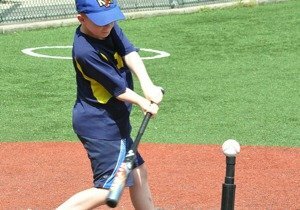 The batter (aka hitter) is entitled to have as many swings as they need to hit the ball. The ball is hit and then caught without hitting the ground. A player who has the ball stands on the base before the runner makes it to the base. A fielder with the glove or hand that is holding the ball tags a runner between the bases. An innings is complete when each player on the team that is batting has had a turn to bat. Once the first team to bat’s innings are all complete, it is the turn of the opposition to have their innings. The Catcher: This role, unlike their baseball equivalent is to place the ball on the tee, catch the ball and to tag runners running for home base. Bases: First Base, Second Base and Third Base positions field in and around their base area and attempt to run out players running for their base. Others: If playing with larger numbers, other fielders are placed around the playing area and are tasked with fielding the ball, catching and trying to run players out. Unlike baseball and in an attempt to encourage fielders to throw, once a throw is made, a runner may only advance to the base they were going for. If runners turn back towards a previous base, they must return to that base. The game is won by the team with the greater number of points at the end of the game.